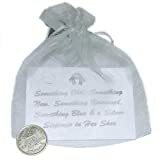 Lucky Sixpence For the bride in Presentation Organza bag – Something old, something new, something borrowed, something blue and a lucky sixpence for her shoe, so goes the rhyme. This entry was posted in Wedding Store and tagged Bride, Card, Gift, Lucky, Organza, Sixpence, XLUCK6 by Formal Affair. Bookmark the permalink.